What may other organs besides the cervix and uterus be removed during a total hysterectomy? What are the different ways a hysterectomy can be performed? In some cases, medications or other procedures that allow you to become pregnant now or in the near future can be tried before having a hysterectomy. Some women wait to have a hysterectomy until after they have completed their families. If you choose another option besides a hysterectomy, keep in mind that you may need additional treatment later. Total hysterectomy – The entire uterus, including the cervix, is removed. Supracervical (also called subtotal or partial) hysterectomy – The upper part of the uterus is removed, but the cervix is left in place. This type of hysterectomy can only be performed laparoscopically or abdominally. 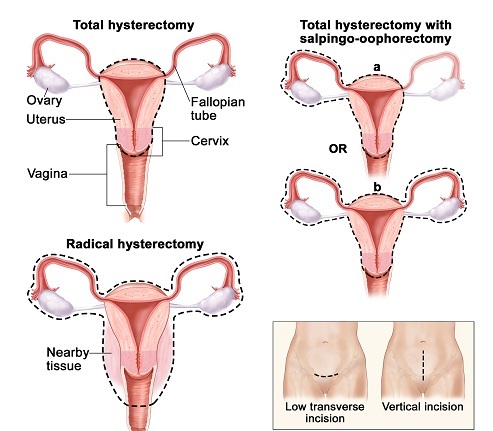 Radical hysterectomy – This is a total hysterectomy that also includes removal of structures around the uterus. It may be recommended if cancer is diagnosed or suspected. Vaginal hysterectomy generally causes fewer complications than abdominal or laparoscopic hysterectomy. Healing time may be shorter than with abdominal surgery, with a faster return to normal activities. It is recommended as the first choice for a hysterectomy when possible. Abdominal hysterectomy can be performed even if adhesions are present or if the uterus is very large. However, an abdominal hysterectomy is associated with greater risk of complications, such as wound infection, bleeding, blood clots, and nerve and tissue damage, than vaginal or laparoscopic hysterectomy. It generally requires a longer hospital stay and a longer recovery time than vaginal or laparoscopic hysterectomy. Compared with abdominal hysterectomy, laparoscopic surgery results in less pain has a lower risk of infection and requires a shorter hospital stay. You may be able to return to your normal activities sooner. There also are risks with laparoscopic surgery. It can take longer to perform compared with abdominal or vaginal surgery, especially if it is performed with a robot. Also, there is an increased risk of injury to the urinary tract and other organs with this type of surgery. Some problems related to the surgery may not show up until a few days, weeks, or even years after surgery. These problems include the formation of a blood clot in the wound or bowel blockage. Complications are more common after an abdominal hysterectomy. Fallopian Tubes: Tubes through which an egg travels from the ovary to the uterus. Fibroids: Benign growths that form in the muscle of the uterus. Oophorectomy: Removal of one or both of the ovaries. Osteoporosis: A condition in which the bones become so fragile that they break more easily. 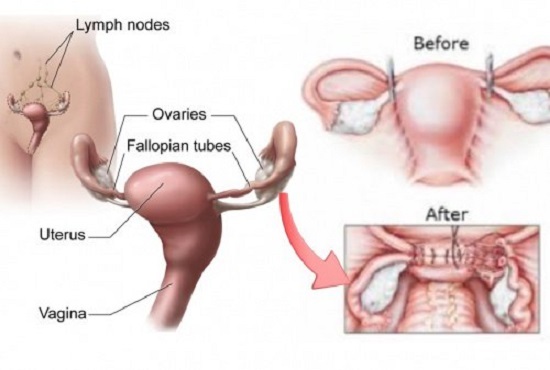 Salpingo-Oophorectomy: Removal of the ovary and fallopian tube; a bilateral salpingo-oophorectomy is the removal of both ovaries and fallopian tubes.